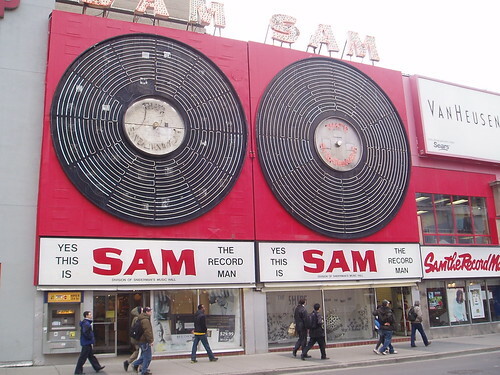 Many years ago, Sam the Record Man at 347 Yonge Street closed. Ryerson bought the building and promised to save the sign. We Torontonians love our signs. City council voted this morning to have the sign reassembled on the roof of 277 Victoria Street, a city-owned building on the east side of Yonge-Dundas Square, and have Ryerson University pick up the bill. blogTO gives us an idea of what this will eventually look like. I'm cool with this. How about you? Truth is (was), those spinning records were not very attractive as objects up close. They are emblematic, a little distance is a good thing. This looks a bit like a billboard, which makes me wonder, why didn't they just find a permanent billboard type location. All this will do is catch the mothership's attention when 'they' attack. Just kidding. I'm fine with it but do you think it will really look that large? In another bygone Canadianism, I spotted a Labatts branded truck cab hauling along its all-Budweiser trailer this week along the 403 highway. While they advertise here about keeping Ontario children safe from 3rd party retailers like the 7-Eleven convenience stores; they continue to market themselves in the USA with a 'brewed in America' campaign. When has anyone, in Canada, last seen a Labatts form of advertising, or a Molson's ad that wasn't just for the single Molson Canadian beer product? When it is time for a PBS business interview about low yielding barley crops in the USA, Coors-Molsons suddenly gets replaced with Coors-Millers. 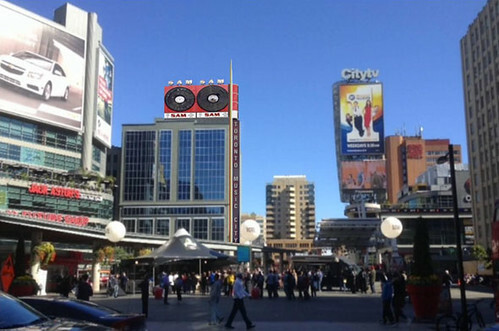 I'm surprised there isn't a move to install a Towers Records billboard instead of Sam the Record Man. Foreign is always better than Ontarian! And while I'm here; the Leafs 1st round draft for 2014 wasn't any surprise. I knew it wasn't going to be an Ontario-born and Cdn. Junior hockey trained athlete. New owners, same snub-the-locals philosophy. Often publicly berated Kadri was their Muslim-minority, all-Ontario, exception in 2009. Hopefully the lights will be working and the record will be spinning. Looks like the best place,close to where there is alot of activity and will blend in with the City TV Billboard across the street. How does it look at night? vest combo like Marty McFly), I guess I'll have to learn to live with this loss the same way I have dealt with the demise of the McDLT and affordable, old-fashioned (paper!) 'adult reading materials'-NOT WELL!! !